Former WBA & IBF jr. welterweight champion Amir Khan has recently made allegations that an unidentified man at ringside during his defeat to Lamont Peterson last month may have interfered with the judges scorecards. 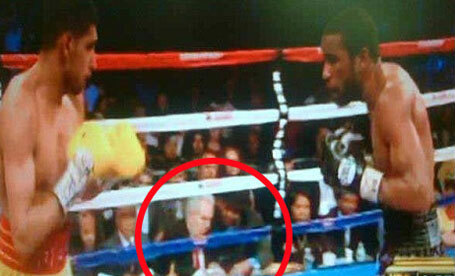 On his official Twitter page, Khan posted numerous comments about the incident, including images which show an "unidentified" man at ringside who, at one point, was sitting next to his father and a member of his camp before seemingly having a conversation with WBA supervisor Michael Welsh and handling the scorecards during the fight. WBA president Gilberto Mendoza claims that he is examining Khan's Twitter allegations and will make a response to Khan's camp within the next 24 hours. The IBF has stated, "with regards to the IBF master scorecard, we can assure that it has not been tampered with." Khan alleges that the unidentified man started to "interfere" with Welsh during the 6th round and continued to do so until the end of the fight. While speaking to Welsh, the man handled the scorecards before they were handed back to Welsh at the end of each round. 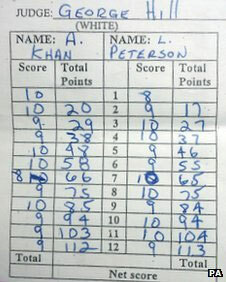 After the fight, Welsh admitted that his scorecards did not match the others. During an interview with Sky Sports news, Khan said that the same man was seen jumping around celebrating in Peterson's corner at the end of the fight. Interestingly enough, Freddie Roach suggested that Peterson would be a good opponent for his star pupil, Manny Pacquiao, but he also claims that, in his opinion, his man Khan "got screwed". Although he has no knowledge of any wrongdoing, Roach was a bit mystified as to why it took so long to get the scores in. While Roach agrees that it is always difficult to prove wrongdoing in boxing, he has called for the DC Boxing and Wrestling Commission, with the help of the WBA and IBF governing bodies, to seriously look into the matter. Khan's manager, Asif Vali, has stated that the camp has written to all of the the boxing authorities about the unidentified man, but neither the IBF or the DC Boxing and Wrestling Commission has responded. The IBF are set to hold a hearing regarding the matter on January 18. This will be a dark chapter in boxing history if these allegations are found to be true, and could really jeopardize the image of the sport. Any talk of a Pacquiao vs. Peterson bout should seriously quiet down until this matter is resolved. Even if these allegations are found to be untrue, then let's hope a rematch does indeed takes place first so these two guys can settle the argument in the ring without any further controversy.